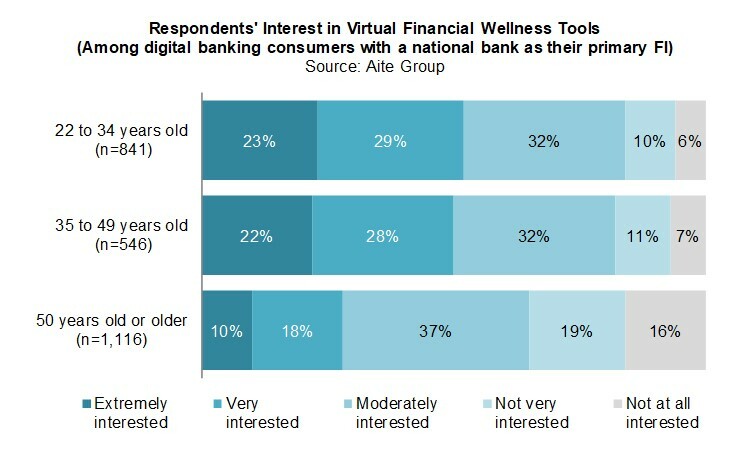 National banks’ 22-to-34-year-old customers show the greatest interest in using virtual financial wellness tools. Boston, June 28, 2018 – While a little more than two in 10 consumers have used personal financial management tools, the interest in PFM is fading away. Now, with the convergence of artificial intelligence, big data, mobile, and other emerging digital touch points, financial institutions in the U.S. are beginning to take the best concepts of PFM and build virtual financial wellness tools—real-time experiences that help consumers understand their complete financial picture and improve their financial health. This report explores consumers’ usage of PFM and gauges their willingness to improve their financial health through virtual financial wellness tools. It is based on a Q4 2017 Aite Group survey of 5,174 U.S. consumers. This 35-page Impact Report contains 30 figures and two tables. Clients of Aite Group’s Retail Banking & Payments or Weath Management service can download this report, the corresponding charts, and the Executive Impact Deck.